When we read the blow-by-blow account of Steve Ballmer's leaving speech, our first thought was that it had to be a joke. But no, it was an actual thing that actually took place, and there's historical video evidence to prove it. 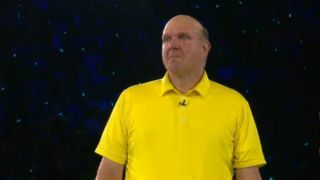 Get the tissues ready - it's an emotional ride and blubbering Ballmer is putting the pedal to the metal. Our favourite part is where he high fives the crowd as he leaves, the sweet and soothing tones of "I've Had The Time of My Life" playing him out. You can go check it out on The Verge right now. What an exit. Then again, he did have Bill Gates's final day at Microsoft to compete with. Now go console your emotional selves with some blips.